Solo's high quality, super acidophilus supplement, containing acidophilus and bifido bacteria organisms. 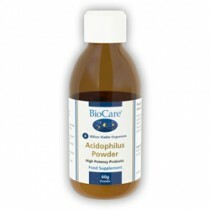 Taking Acidophilus offers the beneficial probiotics without the need to eat a yoghurt or drink dairy products. The Bulgarians consumed the first organisms, implicated in providing benefits to health, first found in yogurt preparations. They believed that this was the source of improved health. In 1907, Metchinikoff first brought to light the value of probiotics, while working at the Pasteur Institute In Paris. He was impressed by the health and longevity of the Bulgarians. Today, commercially produced popular yogurt or yoghurt drinks offer a drastically reduced number of organisms, by the time they're consumed. It may be better to supplement with Solo's concentrated culture. Flora are natural health giving organisms, found in the Colon. Super Acidophilus with F.O.S. (fructooligosaccharides) supports the growth of beneficial bacteria in the gut. Together, these ingredients ensure a healthy balance of the flora in the intestines and the Colon. Acidophilus can also improve digestion, produce vitamins, and increase resistance to infections. Probiotics can also relieve symptoms of (IBS), irritable bowel syndrome. Stress, antibiotics and prescription drugs can severely deplete the friendly flora in the gut. Try a course for 3 months and see the difference in general health and well-being.